Artistic challenges can sometimes make me hard to live with. Just ask my husband. Throughout my career these challenges have caused more sleepless nights than I care to remember. That being said, I must admit I loved creating this commissioned piece, “Brilliance Afire.” This was a gift for someone who loves dragons, but not any old dragons. “My husband likes the ones more like Harry Potter and less cartoony, “ said Marcia Zeinner. I explained that while creating the entire creature was possible, it would be more dynamic if I cropped it just above the shoulders. This would create radiance and give the eye significant expression. She sent me one of his favorite images from a pattern book used in making tattoos. He had tabbed it years ago and forgotten all about it. It was the perfect choice, and with her willingness to give me complete artistic freedom, I was anxious to start. Now the fun began. Materials: craft felt, merino wool, tussah silk, angelina fibers, cotton fabrics, metallic scales, banana fibers, and cotton threads. 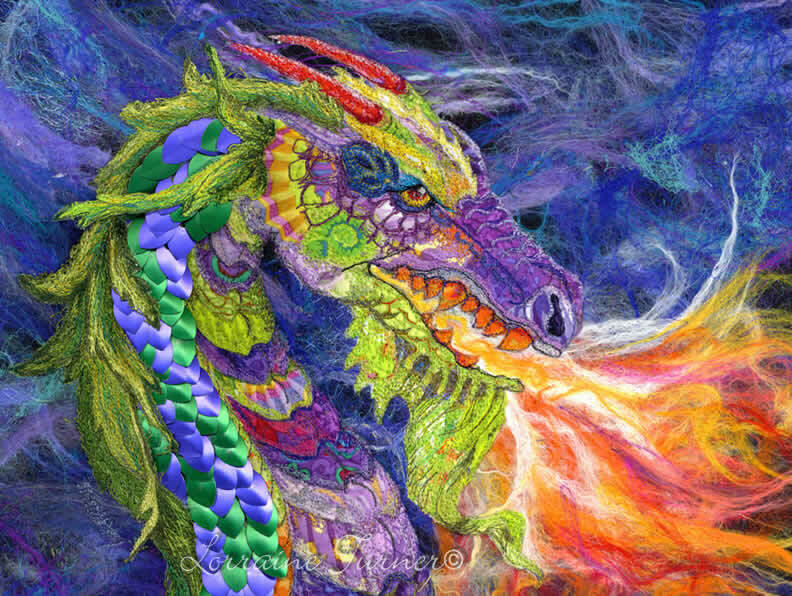 Application: In order to create the look and feel of something magical, and to make the dragon stand out, I chose a night sky of purples and blues for the background, and added just a hint of shimmering, angelina fibers. I cut a piece of black craft felt 18” x 15” for the base and wet-felted the fibers into this. Wet-felting can often dull the vibrancy, so I needle-felted additional color to the flames, adding back the luster, but only after I had completed my free-form sewing. Sewing on felt must be approached slowly because the thickness can break the strongest needles. Using a light box I traced the drawing onto thin fabric and adhered it to the background using Misty fuse. I selected fabric prints that illuminated the mythical creature’s face and neck, and snipped and pinned them in to place. I then thread-painted the collage using Aurifil 50 wt. cotton threads. Next, I hand stitched the metallic scales, carefully overlaying them using Nymo nylon beading thread. This added the armored look I was going for and luckily I had found just the right color to create drama. The mane could have been created using a variety of techniques such as thread painting, cut-up lace, hand embroidery, or couching with cords or ribbons. I couldn’t find the right colored embellishments, so I decided to create the mane using thread stitched onto organza with water-soluble stabilizer. I then hand-stitched the mane onto the dragon’s back being sure to cover the top edges of the metallic scales. The entire process took me almost a week and luckily I was able to ship it to the happy client a month earlier than she had expected. Talk about magic! And how did her husband react? It was such a treat to bring joy to Marcia’s husband, as creating with a passion of purpose is one of my greatest joys. In closing, I hope you will be inspired to apply my techniques to your own creations. For more instructions, please consider my upcoming webinars and workshops. If you would like a commissioned piece for YOUR special someone, please contact me. Here is where I purchased the dragon scales. Your work reminds me of when I was in college, taking my fifth Life Drawing class. I started working with colored pencils to draw the images. Each were multi colors, similar to what you do with thread . I really enjoyed looking at your pieces, wishing I could touch them. Your work is tremendous! I do hand embroidery and enjoy the meditative process. I’ve experimented with some dimensional work with mixed results. I would love to take one of your workshops. Where can I find your schedule? Also, I would be interested in how you organize all your different materials. Thank you for sharing your work and techniques. In addition to what is already posted, I will be attending Quilt Festival Houston Nov., 2018, MQX New Hampshire Apr., 2019, Festival of Quilts, UK kicks off my workshop tour Aug, 2019 and Uluru, Australia “Sewing Up a Storm,” in Aug., 2020. FYI – you can purchase the silver color dragon shells then paint them with alcohol inks. You would not believe the results. You can mix colors and they change and blend beautifully. As long as the “shells” are non-pouris you can use alcohol inks.